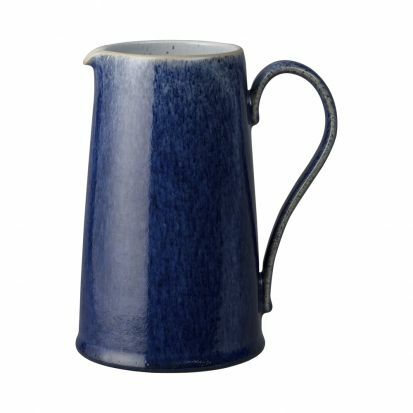 Denby’s Studio Blue is the epitome of Denby’s artisan and handcrafting skills with stunning textural glazes perfected over 200 years and reinvented for a modern audience. Inspired by the trend for an honest and rustic comforts of entertaining in the home, with the range featuring bowls, plates and platters designed for mixing and matching with your existing tableware. Studio Blue combines four tonal glazes in cool, calm blues, greys and white hues taking influence from soft natural tones, raw textures and subtle glazes. This artisan collection combines smooth and ridged textured pieces and features colourways in Chalk, Pebble, Flint and Cobalt, creating a natural aesthetic when stacked or mixed with existing pieces. This quality stoneware collection, which is made in England, has been created using skills perfected over 200 years. The spectacular glaze reaction in the kiln ensures each piece is carefully created and completely unique. The ability to be used in the oven, microwave, freeze and dishwasher makes this tough enough for everyday and stunning enough for best. This informal tableware collection is designed to complement a variety of global foods. It includes a wide range of bowls in various shapes and sizes, ideal for pasta, ramen and rice dishes, to reflect the nation’s continuing love of bowl food.